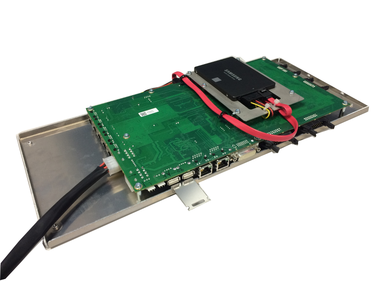 The Vi400/600 Control Module is designed to directly replace the Vi4/6 ‘silver box’ Control Module and provide a faster processor, more reliable performance with hard-soldered DisplayLink-based graphics outputs rather than the PCI graphics card of the original system. The new module runs a variant of V6.x software, but with a cut-down feature set compared to Vi000- series consoles, appropriate to the capabilities of the Vi2/4/6 surface and Local Rack. A useful application for this upgrade would be to give an existing surface a new lease of life and allow it to function as an emergency backup surface, rather than being disposed of, when a full Vi5/7000 upgrade is purchased. The control surface will externally remain a Vi4 or 6, but will identify as a Vi400 or 600 on its main Menu screen. Note that the control module upgrade is also available for Vi2 consoles, which will become Vi200 once upgraded. Installation is straightforward and requires only basic tools as the new Control System Module is connector-compatible with the original ‘Silver Box’ unit, and mounts to the chassis using the same fixings. Some re-routing of internal cables is necessary along with the removal of some parts of the original system which are no longer required, but all of this can be done without soldering. The upgrade process should take around an hour, depending on level of technical experience. If in any doubt, your local Soundcraft distributor or agent can perform the upgrade for you. Although the Control Module is supplied with operating software installed, a software update should be performed once the modified console is up and running. The latest software upgrade files and matching Virtual Vi Offline Editor are available via the Downloads tab of this web page. Full installation instructions are provided in printed form with each Control Module, and are available to download below.